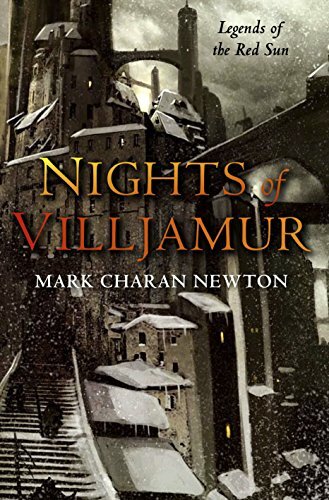 Review: Nights of Villjamur by Mark Charan Newton – King of the Nerds!!! This was by and large one of the best titles I’ve read this year. Had Tor U.K. not sent me an ARC for review I’d be converting my dollars into pounds and not regretting that fact for a single moment. Nights of Villjamur is the debut novel (technically the second novel) by Mark Charan Newton. It is a novel colored by shades of gray that reveal a startling depth and breathtaking landscape that is a much a character as a setting. The ancient city of Villjamur, seat of the Jamur Empire, is more or less under lock down as both its rulers and general population prepare themselves for the coming ice age heralded by the world’s cooling red sun. Amongst the halls of the imperial palace politicians jockey for power while on the quickly freezing streets an aging Investigator struggles to hold his marriage together while trying to solve the murder of a prominent politician. Elsewhere the cultist of two power sects clash over the fate of the world, and what may lay beyond, while an albino military commander is sent to uncover the truth behind possible genocides occurring to the north of the empire. If that plot summary sounds big, rest assured that Newton hinges each major plot line on one or, in some cases, several very distinct POVs that give the rather epic plot a far more intimate feel. Admittedly some of those POVs take a while to get used to. The womanizing, and vain Randur in particular engendered a considerable amount of dislike on my part but over the course of the novel Newton manages to imbue him with a surprising amount of depth and, despite his foppish attitude and insufferable arrogance, he manages to become quite the likable character. Even the villainous perspectives make for enthralling reading. Though I admit that the main orchestrator of events in the novel occasionally threatens to devolve into the role of mustache twirling caricature Newton again manages to pull back and imbue him with a fascinating balance of madness, cunning, and charisma that frequently left me open-mouthed in horror rather than aghast with incredulity. Inspector Jaryd is the most familiar figure of the bunch and, along with the shadow tinged atmosphere, certainly lends an aspect of noir and hardboiled crime fiction to the mix. Jaryd is the cynical detective, harden by the streets and rarely surprised by the horrors his city has to offer and has more in common with Sam Spade (or the young Jim Gordon from Batman: Year One) over any fantasy hero. Newton is extraordinarily sparing in terms of exposition. The story is carried forward on the strength of the characters and oppressive atmosphere. There are few, and none that really stand out in my mind, of the dreaded info dumps that frequent the fantasy genre. Instead Newton seeds the story with hints of the world’s mysterious past. In particular the frequent mention of the magical devices employed by cultists as “technology” lend clever hints as to the previous nature of the world. It is a world that feels complete yet one whose subtle hints of past glories and fallen civilizations leaves wanting to more. No where is this more evident than in the city of Villjamur itself. It is a place where humanity has settled amongst the ruins and buildings of a long dead civilization with architecture that is alien and frequently unsettling. The beauty of it is that it isn’t something we ever really see outright. As atmospheric as Villjamur is Newton manages to sketch it in such a way that he leaves the details of the experience of the reader’s imagination. It is a city in shadows and we are only offered infrequent glimpses of clarity as to its specific nature and construction. Another great review of NIGHTS OF VILLJAMUR. As I wrote on an other blog I MUST buy and READ this book…..